Harbor Passenger Steamer: Built in 1898 by Robert Palmer and Sons, Noank, CT; Acquired by the Navy, 28 February 1918; Commissioned, 20 June 1918 at New York; Returned to her owner 6 May 1919. Fate unknown. Specifications: Displacement 434 t.; Length 145'; Beam 31' 2"; Draft 8' 6"; Speed 14 kts. ; Complement six; Armament none. 98k Photographed prior to her World War I Navy service. 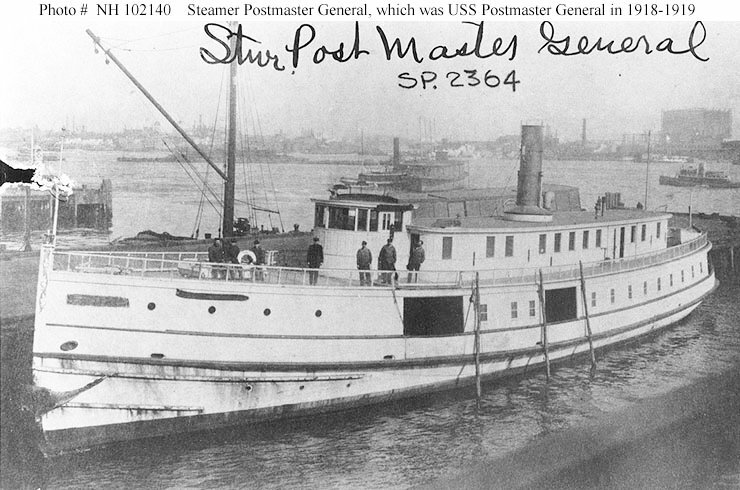 Dictionary of American Naval Fighting Ships History: Postmaster General (SP-2364) was built in 1898 by Robert Palmer and Sons, Noank, Conn.; chartered by the Navy from Harbor Steamboat Co., New Rochelle, N.Y. 28 February 1918; and commissioned at New York 20 June 1918, Chief Boatswain Edward Cunningham, USNRF, in command. During World War I Postmaster General served with the 3rd Naval District patrol forces on mail duty. She was returned to her owner at New York 6 May 1919.